Kensington Gardens Two-Tier Solar on Demand Fountain [ID 68724]. Lightweight and maintenance free Resin with a antique White Stone finish. Creates a relaxing atmosphere on your patio, deck, balcony or in your garden. Solar-on-demand allows you to choose when you wish your fountain to work using an easy on/off switch on the solar panel. Operate daily and use our battery technology to provide consistent performances even cloudy weather. Turn off to charge during the day for night time use. Battery will fully charge in 1 sunny day. Battery capacity for up to 6 hours of operation. Patented underwater integral solar panel & pump system. Constantly recycles water from a hidden reservoir. No wiring or operating costs, simply install and enjoy. L x 16.34 in. W x 22.83 in. In line with our policy of continuous product development Smart Solar reserves the right to change, vary or alter the product specification without prior notification. If you have specific questions about this products guarantee, please contact our Customer Service department. 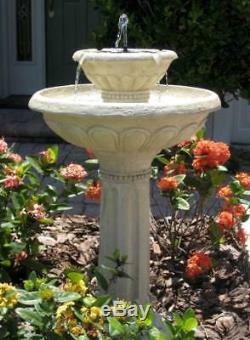 The item "Kensington Gardens Two-Tier Solar on Demand Fountain ID 68724" is in sale since Saturday, July 21, 2018. This item is in the category "Home & Garden\Yard, Garden & Outdoor Living\Bird & Wildlife Accessories\Birdbaths". The seller is "shopladder" and is located in Forest Park, Illinois. This item can be shipped to United States, Canada, United Kingdom, Denmark, Romania, Slovakia, Bulgaria, Czech republic, Finland, Hungary, Latvia, Lithuania, Malta, Estonia, Australia, Greece, Portugal, Cyprus, Slovenia, Japan, China, Sweden, South Korea, Indonesia, Taiwan, South africa, Thailand, Belgium, France, Hong Kong, Ireland, Netherlands, Poland, Spain, Italy, Germany, Austria, Israel, Mexico, New Zealand, Philippines, Singapore, Switzerland, Norway, Saudi arabia, Ukraine, United arab emirates, Qatar, Kuwait, Bahrain, Croatia, Malaysia, Brazil, Chile, Colombia, Costa rica, Panama, Trinidad and tobago, Guatemala, Honduras, Jamaica, Antigua and barbuda, Aruba, Belize, Dominica, Grenada, Saint kitts and nevis, Saint lucia, Montserrat, Turks and caicos islands, Barbados, Bangladesh, Bermuda, Brunei darussalam, Bolivia, Ecuador, Egypt, French guiana, Guernsey, Gibraltar, Guadeloupe, Iceland, Jersey, Jordan, Cambodia, Cayman islands, Liechtenstein, Sri lanka, Luxembourg, Monaco, Macao, Martinique, Maldives, Nicaragua, Oman, Peru, Pakistan, Paraguay, Reunion.